We’re not necessarily telling you that your home security system is useless. That’s not the case! However, that home security system is only as good as the locks on your door. Many home burglaries are spur of the moment. According to a burglary study conducted by the University of North Carolina at Charlotte, only 12 percent of burglars regularly planned out a burglary in advance. Now, the study only spoke with convicted burglars, so that number may vary if data from non-convicted burglars was somehow included. But what that number tells us is that most burglaries are unplanned, spur-of-the-moment crimes. Burglars aren’t often taking the time to invest in technology to help them deal with home security systems. More often, they rely on speed to get in and get out before the security system can notify the authorities. Deadbolts are such a good precaution against burglars because they really slow down how quickly a burglar can get into a home — at least, they can when installed correctly. In that same study, most of the burglars surveyed (seven out of eight) said they wouldn’t try picking locks or using a duplicated key. Instead, almost 88 percent of burglars said they would try to force a door or window. The reason deadbolts are such a good security measure is because they can really impede the speed with which someone can force a door open. A correctly-installed deadbolt can take a handful of minutes (or more) to force through. In a burglar’s world, that’s more than enough time to be seen and stopped. A deadbolt can be a great, low-tech way to stop a burglar. 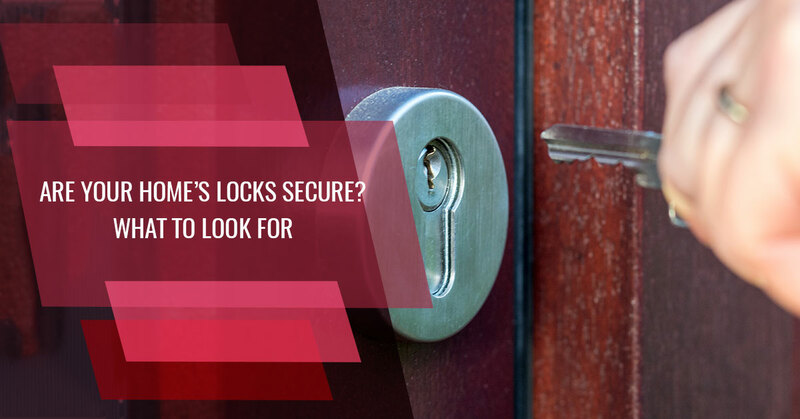 However, a deadbolt is only a lock; it’s only going to be a helpful burglary inhibitor if it’s installed well. There are a few different elements to be concerned with when it comes to a deadbolt installation. Those include the bolt itself, the strike plate, and how everything comes together. First and foremost, you want to make sure the lock is installed well so it doesn’t stick or jiggle loosely. Both of these are potential security issues, but they are also just nuisances during everyday use! If you’re installing the lock yourself, you’ll want to measure carefully to make sure the lock components in the door line up appropriately with the door frame. If you’re unsure, a local locksmith can handle the installation for you quickly and ensure everything is installed properly for better security. When it comes to the deadbolt, the bolt portion of the lock is going to be one of the most important elements. That thick metal bolt is the primary source of strength in a deadbolt lock. When the lock is engaged, the bolt should extend as far into the door frame as possible, but it will also need to be installed in the door far enough back that the edge of the door won’t splinter apart if someone tries to force the door open. Most deadbolt locks will come with instructions in terms of those lengths. But, generally, you should expect the deadbolt to extend into the door frame at least an inch when engaged. Next, you’ll want to pay attention to the strike plates. These are the pieces of metal that go around the deadbolt on the door and doorframe. The point of the strike plate is to make it harder for the wood of the door and frame to splinter if someone tries to force the door. However, this is the biggest area that most deadbolt locks fail. Generally, contractors installing locks and even the lock kits themselves come with screws that are too short. Most of the time, strike plates are installed with screws that are only an inch long, or less. When someone tries to force the door, the strike plates provide a bit of resistance, but short screws mean less leverage and the wood will split more easily, allowing the lock to give way. We suggest installing the strike plates with screws at least three inches long. This way, even when force is applied to the lock, the longer screws provide improved resistance that makes it much harder to force the door open. For even more security, you can also replace the standard strike plate with a box strike plate. This provides a metal-lined channel that goes into the door frame, connected to the strike plate. When the deadbolt is engaged, that’s a double layer of metal extending from the door into the frame. It provides double the strength and makes it even harder for a door to be forced open according to Consumer Reports testing. When it comes to choosing a deadbolt, you don’t necessarily need to choose that high-tech keyless entry lock — though that is a great option for anyone who wants to ditch the hassle of keys. A standard deadbolt is going to provide a good level of security as long as it’s installed properly, so you can choose the lock that will best match the other hardware on the house. However, we do recommend doing a bit of research into different lock brands. Locks are generally rated by grade from one to three, with a Grade 1 being the most difficult to disable. Lock packaging doesn’t often list out the grade, so you may want to go online or call your nearby 24-hour locksmith for guidance. From lock installation to rekeying and more, your local 24-hour locksmith is an excellent source for improving your home security. Connect with Pro-Lock & Safe in Dover to learn more about how we can help!